New from Tokyoflash Kisai Spider. Japanese watchmaker Tokyoflash pleased its fans novelty Kisai Spider. Watch in stainless steel. Instead of the usual dial masters chose display to display the time by using the web. Every 15 minutes, the screen displays one of 15 animation options weaving a web, which can be disabled. 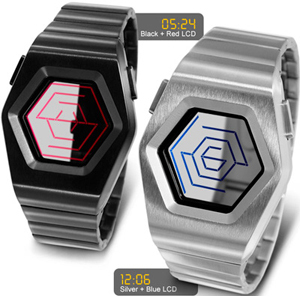 The display of the new watch is made in several color versions: black, blue, green, red. A body may be black or silver. The cost of the clock is $ 180.